This is a VTOL aircraft, with hover capability, range and economics challenging helicopters as well as wing-borne aircrafts. The in-line mounted twin engine concept is designed for a high Thrust-to-Weight ratio, thus if one engine loses power during hover, it results in a survivable rate of descent. During wing-borne flight, one engine can be turned off for better fuel economy, without the need for drag-inducing re-trimming. There is no need for load transfer from one engine to the other, since the twin engines are mounted in-line. By piggy-backing the nose rudder on the nose wheel steering, one or more actuators can be eliminated, resulting in weight and cost savings. 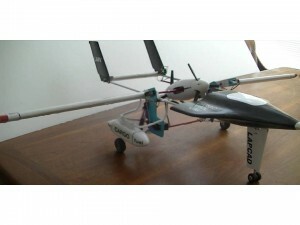 A sub-scale model of 6 feet wing span has been flow in both wing-borne and hover mode. By mounting the power unit centrally instead of distributed, duplicity in the form of cross coupling has been avoided. The concept is designed for a high Thrust-to-Weight ratio during hover, thus if one engine fails, a safe descent is achievable with minimal damage. As the thrust setting of one engine is increased and the other decreased, a net torque is imposed on the aircraft causing it to yaw while hovering. 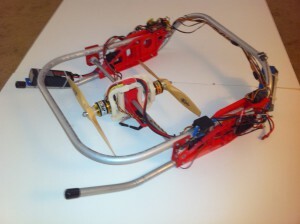 During wing-borne flight, one engine can be turned off for better fuel economy, without the need for drag induced re-trimming. There is no need for load transfer capability from a functional engine to a malfunctioning one, as is the case with engines mounted at the wing tips or other de-centralized locations. The road-able vehicle provides the kind of terrain independence needed during special missions. The four blue-colored canopies provide accommodation for four passengers or soldiers. The Twin Propeller Attitude Control (TPAC) Air Vehicle functions similarly to a quadcopter. The Proof Of Concept (POC) version has two electric motors each developing about two horse power, resulting in a total max thrust of 16-20 lbs. The vehicle utilizes a hybrid stabilization system, that needs only two motors in order to achieve full control of altitude, forward/aft and lateral motion, and yaw. Forward/aft motion is achieved by means of differential thrust, while lateral motion and yaw control is via thrust vectoring. Application of differential thrust results in some yawing, counteracted by thrust vectoring. 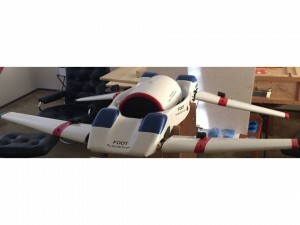 The weight of the POC is approximately seven pounds, making for an acceleration factor of nearly 3G. The horizontal max velocity of the POC is estimated at around 50 MPH. 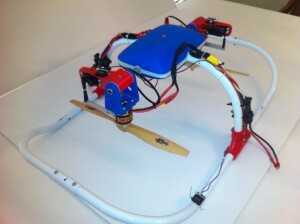 Several locations are available for mounting payload and sensors. All non-metallic parts are 3D Printed. All tubular components are made from aircraft quality 6061-T6 Aluminum. All information is subject to change without notice. All rights reserved.